Eco-Machines for a variety of applications. living walls to purify air. While Director of the Center for Sustainability at Penn State, Tania oversaw the testing, student course work, funding and design of the Eco-Machine eventually built at Penn State. Erin English, a former student of Tania's at Penn State, was the chief engineer and designer of the Eco-Machine, working for John Todd at Ocean Arks International. The facility was completed in 2005. The project was funded by a PA Department of Environmental Protection Growing Greener Grant in conjunction with Penn State. This project brought to Penn State a research site for testing biological processes for treating waste streams of various kinds. 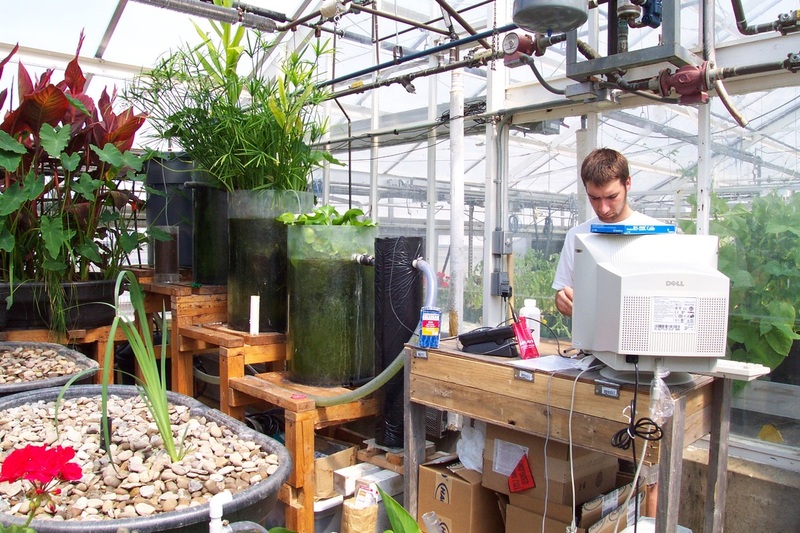 Several students went on to careers in water restoration. Descriptive material for the project, together with many images of work undertaken by students, the phases of construction, and completed Eco-Machine can be viewed here. Professor Rachel Brennan now supervises ongoing research at the facility. In 1990 Gene organized the residents of the Julian Woods Community to submit a proposal to the Pennsylvania Energy Office for an energy conserving evapotranspiration (ET) waste treatment system for small community use in rural areas. This was to be a zero-discharge technology using plants and biota in tanks driven largely by the sun. The proposal was accepted, funded and built. It consisted of a two-stage greenhouse to treat graywater and sewage (blackwater). Blackwater was cleaned and recycled for use again in flushing toilets. Graywater was also cleaned and recycled. Excess water was run through the large greenhouses where plants took up the water and transpired it into the air. In 2006 the plants in the ET began to show signs of distress. Based on her experience with the Penn State project, Tania was called in to analyze the dysfunction and recommend correctives. Julian Woods took corrective action, and the ET Greenhouse returned to proper operation. In the late 1990s, Gene and Tania followed the development of a co-housing community named Hundredfold Farm, then in formation near Gettysburg, PA. The group was interested in living lightly on the earth, building passive solar houses, and growing some measure of their own food. This group faced a challenge similar to that faced earlier by the Julian Woods Community -- namely, treating sewage from a rural subdivision on poorly drained soil. Gene and Tania suggested the concept of the Evapotranspiration Greenhouse and recommended as the engineer the person who had done the design work on the Julian Woods ET Greenhouse. Through persistence and hard work, Hundredfold Farm was able to get the permits through the PA Dept. of Environmental Protection, and build the ET Greenhouse. It is up and running today, handling the sewage from 14 homes.